Arthouse Hotel specialises in stylish group accommodation, fitted with deluxe beds and luxury facilities including a dazzling whirlpool bath. 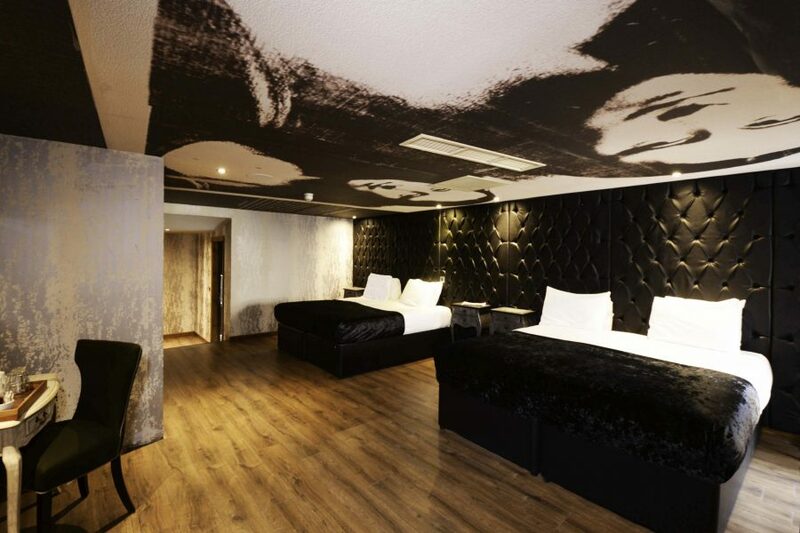 Sleeping up to four guests, you can enjoy a sociable yet spacious stay in Liverpool with friends or family. Whether you’re set on exploring Liverpool’s famous sights or looking to make the most of the city’s nightlife, we’ve got you covered. Located in the heart of the city centre, you’ll find Liverpool’s best shops, restaurants, sights and clubs right on your doorstep! Pop Art pioneer Andy Warhol created the Colored Mona Lisa following the momentous tour that saw Leonardo da Vinci’s masterpiece arrive in the States. An iconic time for both America and France, this unexpected gesture was undoubtedly fuelled by the charms and passion of Jackie Kennedy. In a defining era for art and culture, the 1960s saw the young and glamorous Kennedy family arrive in their new American home, The White House. While President Kennedy certainly captivated hearts around the world, it was his enigmatic wife First Lady Jaqueline Kennedy who transformed the city of Washington, D.C into a vibrant artistic hub. The public saw Washington become a go-to spot for events, attended by leaders and pioneers of the arts. The alluring First Lady was renowned for her stylish and elegant presence, arguably influenced by her passion for French fashion, art and literature. Crowds in France were just as enthralled by Jackie herself, so much so that President Kennedy joked about being “the man who had accompanied Jaqueline Kennedy to Paris”. Jackie excelled in building connections, often where her husband fell short. The First Lady was able to build foreign relations that proved useful on a personal level and for America. When Jackie embarked on a private tour of the National Gallery of Art, she was set on seeing 400-year-old masterpiece Mona Lisa brought to the States. Jackie’s connections certainly worked in her favour. Though elegant and warm, the First Lady was a fierce negotiator, expressing her interest multiple times to Andre Malraux. The French writer and Minister of Cultural Affairs agreed to drive persuasion on her behalf. Fuelling widespread excitement and speculation, France felt the pressure of both Jackie and the public to fulfil her wishes. France controversially agreed to ship the Mona Lisa to the States, and the rest is history. It didn’t take long for public excitement to build. The hysteria surrounding the voyage could easily be equated to celebrity culture today. Passengers aboard the ocean liner that carried Mona Lisa celebrated the news by hosting their very own Mona Lisa-themed parties, while the chef created themed dishes to indulge in. Once the ship reached New York, the iconic piece of art was taken to Washington D.C…under the official supervision of an armed guard, of course. Making its mark in history books, the eagerly awaited exhibition opened in January 1963, and the occasion certainly wasn’t a casual affair. Attendees included the President’s cabinet and all siting U.S senators and congressmen. It was a momentous day for France and America, binding the countries together and easing turbulent political relations. The overwhelming public response to the exhibit saw museum opening hours extended, and the excitement didn’t stop in Washington. The Mona Lisa was also put on exhibit in New York’s Metropolitan Museum of Art. Impressively, over a million people ventured out to see the historic piece. Unsurprisingly, Warhol was enthralled by the Pop Culture frenzy that swept across America. Renowned for documenting pop culture, Warhol set out to produce the Colored Mona Lisa, one of his most highly regarded pieces. An early work of Warhol’s, it has been suggested that this colourful creation foreshadowed the infamous work that followed. Warhol had taken the significance of a moment in time, with its public hysteria and media coverage, and laid it out on canvas for the world to see for generations. Warhol’s career went on to revolve around the fusion of consumer culture and high art, making his work some of the most recognisable in the world. Andy Warhol, born Andrew Warhola is best remembered for his colourful and dynamic paintings, capturing the best of pop culture over the years. Transforming one of the world’s most classic pieces of art into a vibrant modern day creation, the Colored Mona Lisa was a defining moment in his career. Though Warhol’s work flourished decades ago, his work is still very much relevant today. Warhol was fixated on the power of consumer and celebrity culture, arguably setting the bar for a fresh take on art; a visual art movement that would only continue to thrive. Some of Warhol’s most notable works include Marilyn Diptych, inspired by Marilyn Monroe and Menlove Ave., the front cover of John Lennon’s posthumous music release. Warhol’s work pushed the boundaries of art, making a statement with a lasting influence.